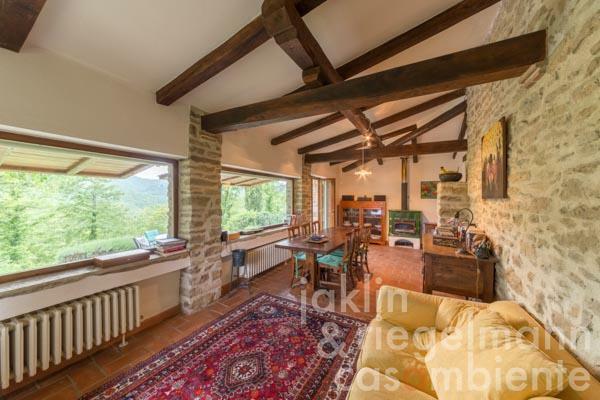 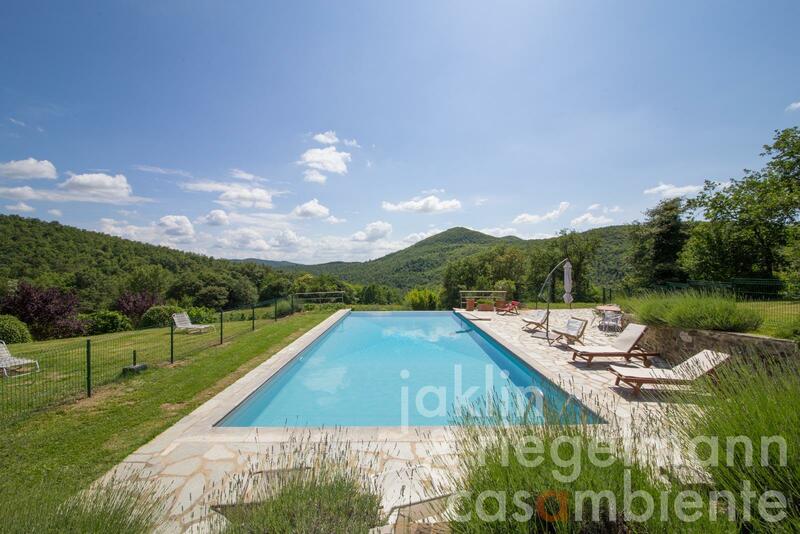 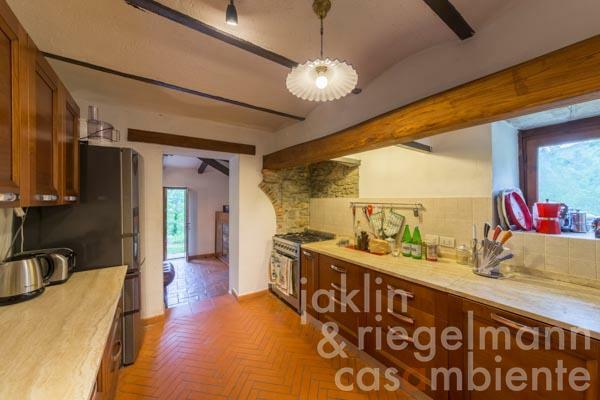 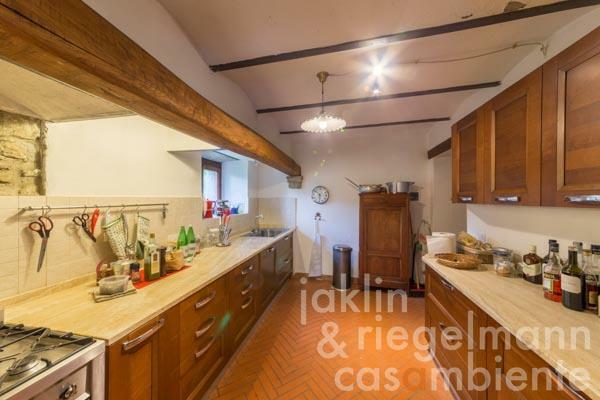 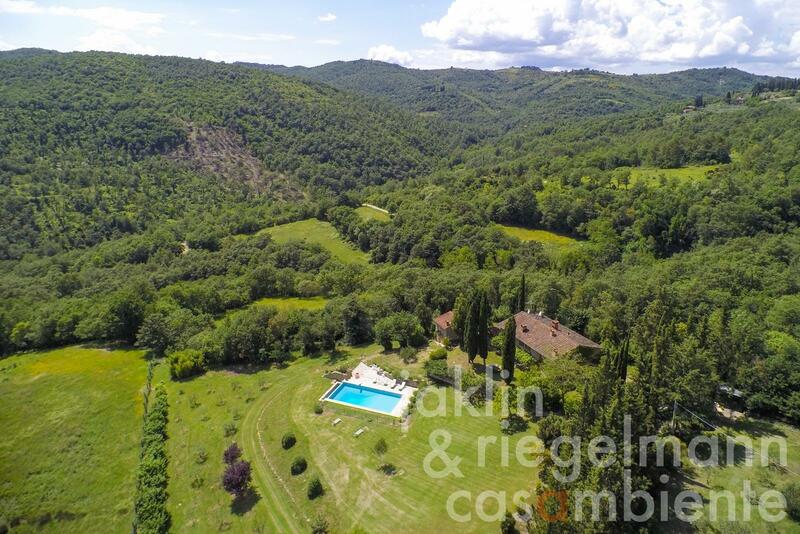 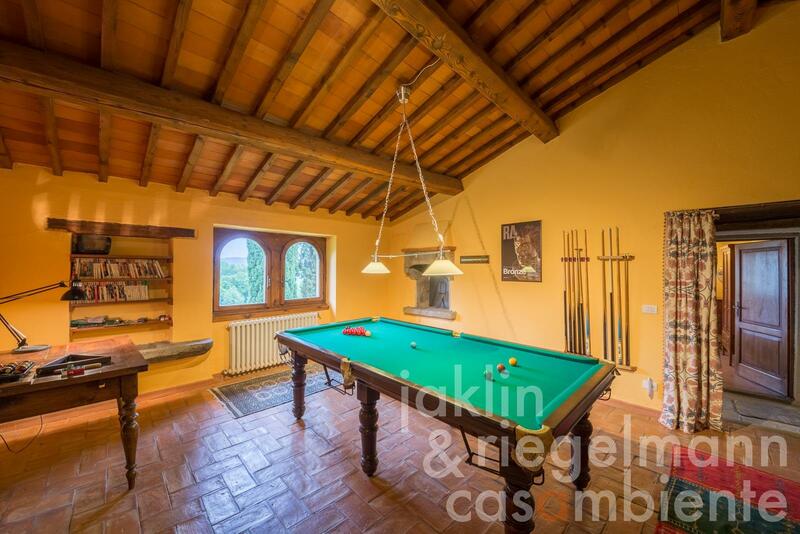 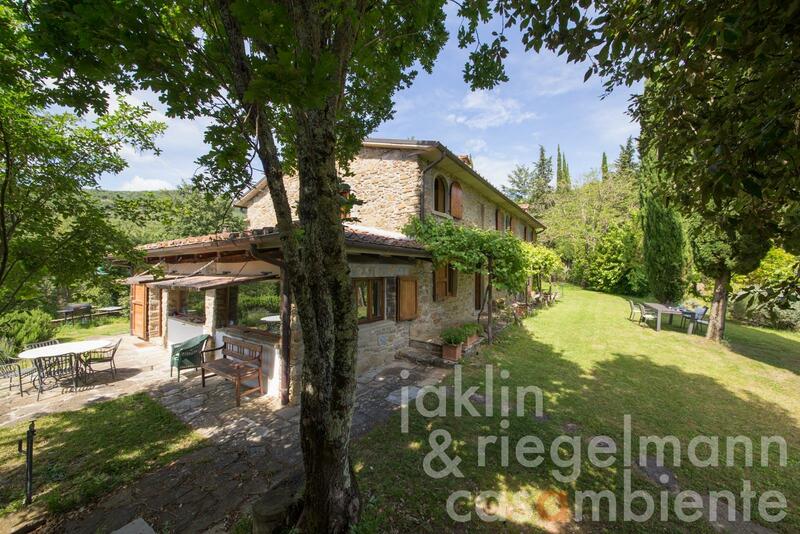 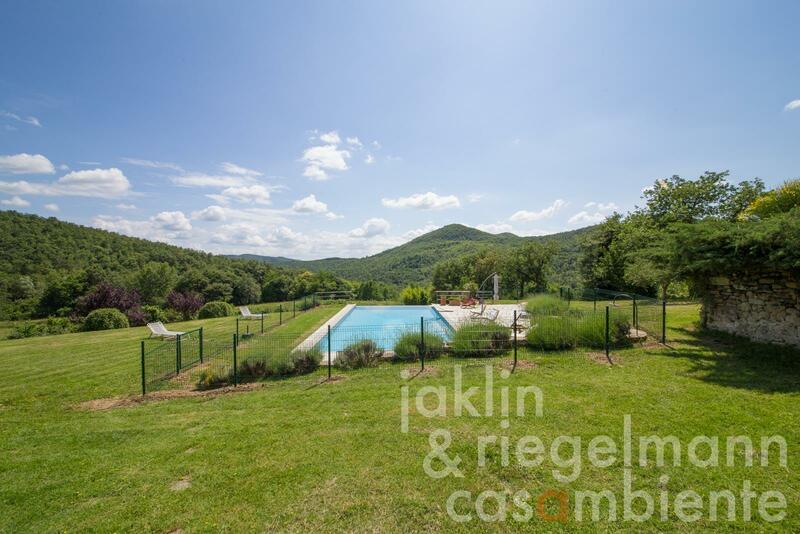 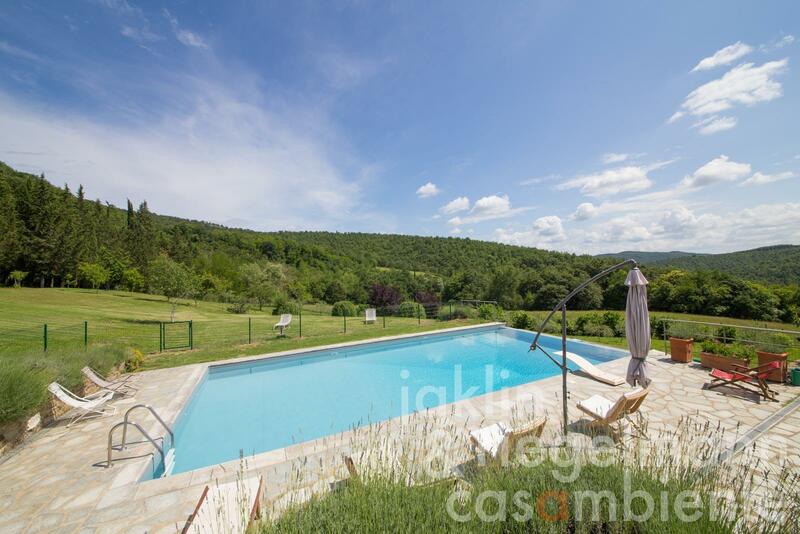 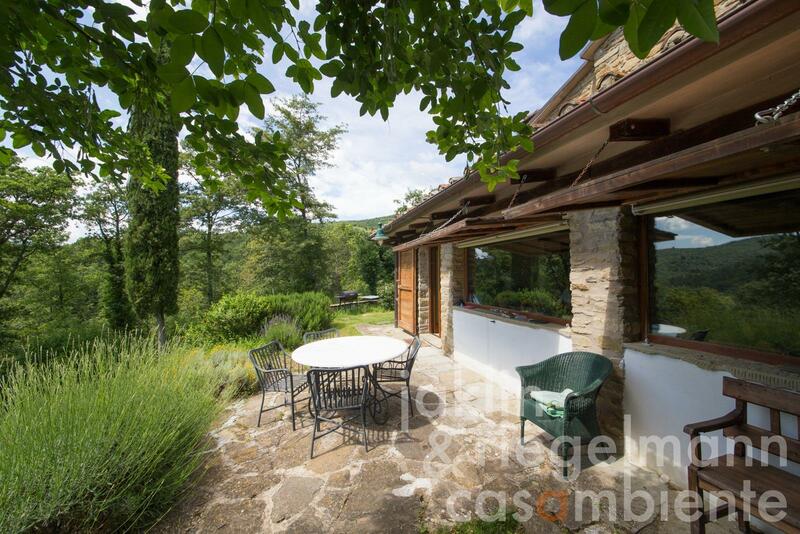 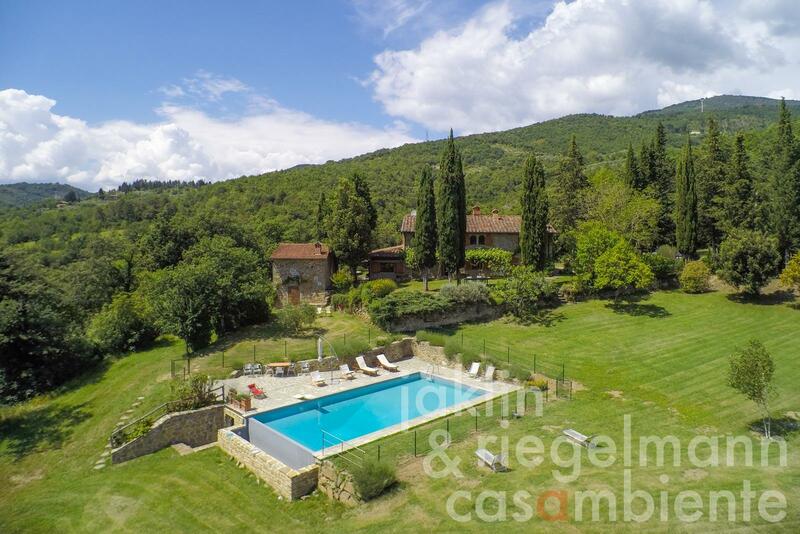 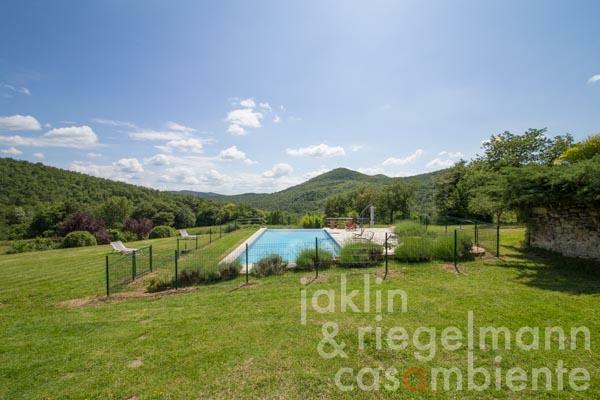 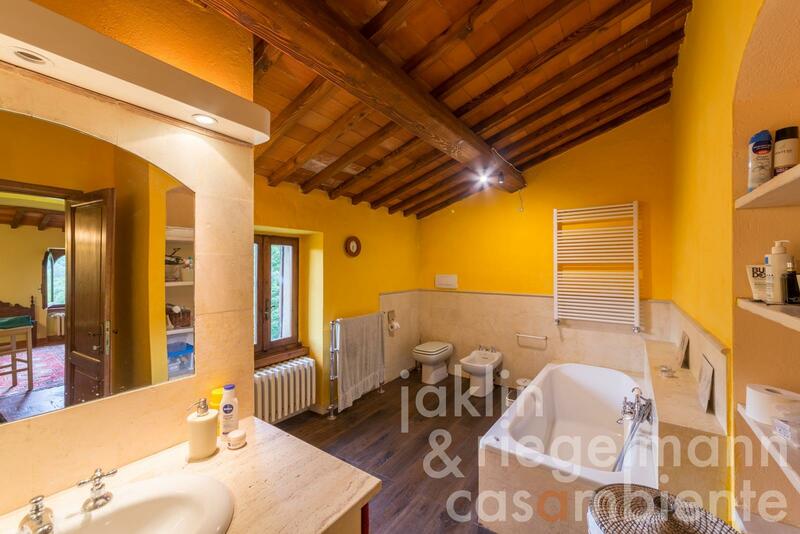 Delightful and traditional stone country house for sale with an infinity edge swimming pool and annexe building, located close to Arezzo and Anghiari in Tuscany. The property is eco friendly with solar heating and its own spring water. 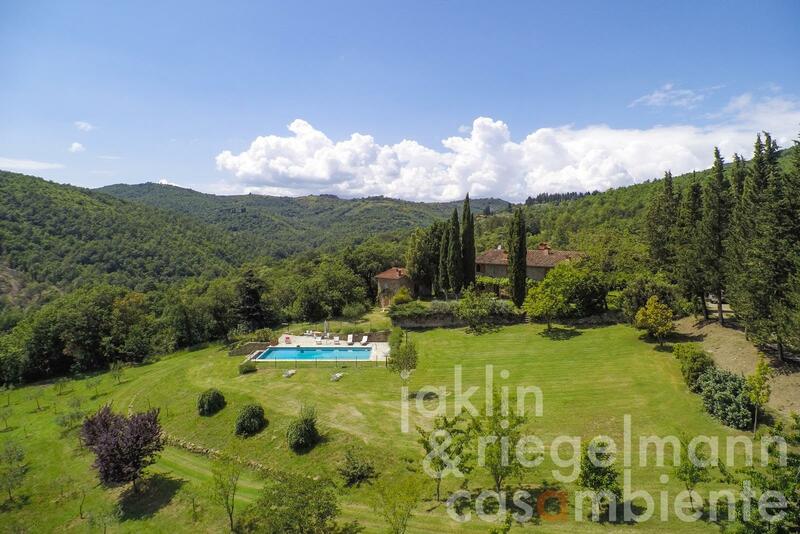 The setting is magnificent and offers absolute tranquility among the forested hills in this pristine part of Tuscany. A Mediterranean garden with well-kept lawns, olive-, cypress- and fruit trees surrounds the houses. The land is bordered on two sides by streams. 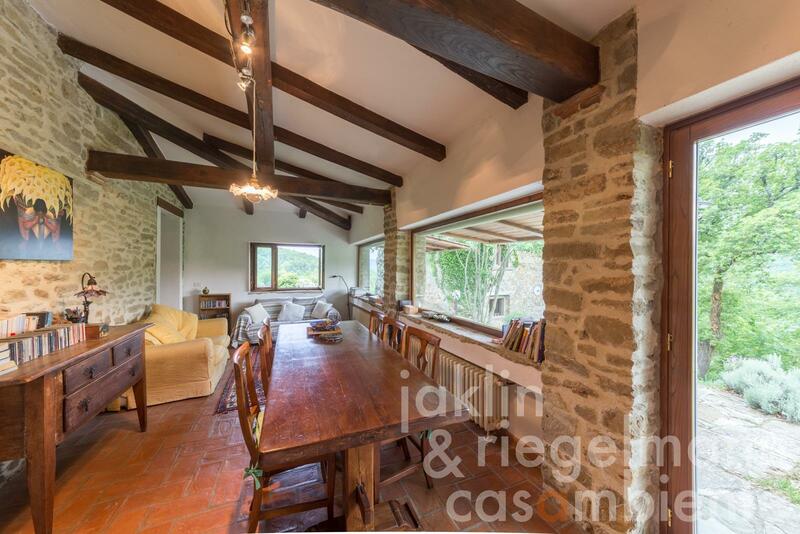 The ground floor in the country house comprises a luminous dining area with a wood-fired oven and direct access to one of the terraces and to the new kitchen, a living room with fireplace, studio, a bedroom with en-suite bathroom, large laundry/utility room and a garage/workshop. 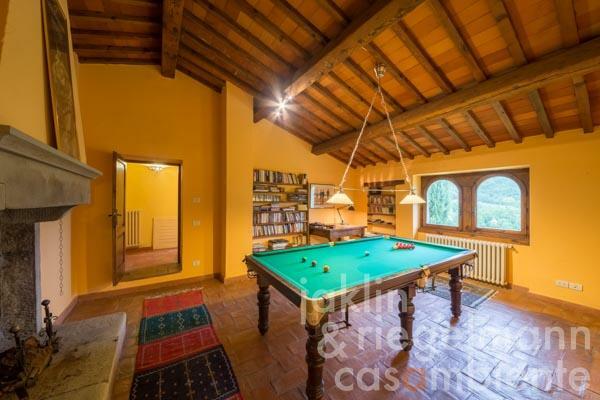 Internal stairs lead to the first floor with three bedrooms, two bathrooms, a billiard room with fireplace and a storage room. 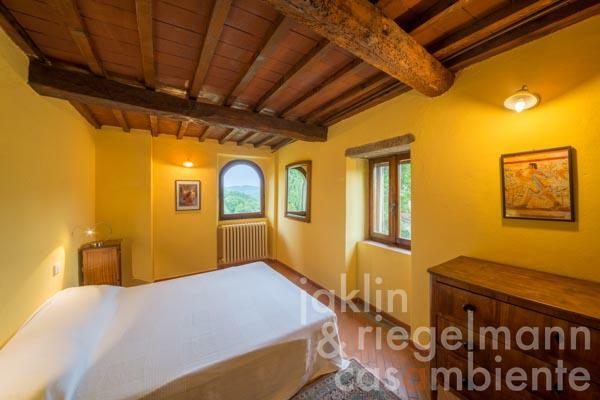 The annexe building offers another bedroom with bathroom on the first floor and, on the ground floor, a changing room with bathroom for the pool or additional bedroom. 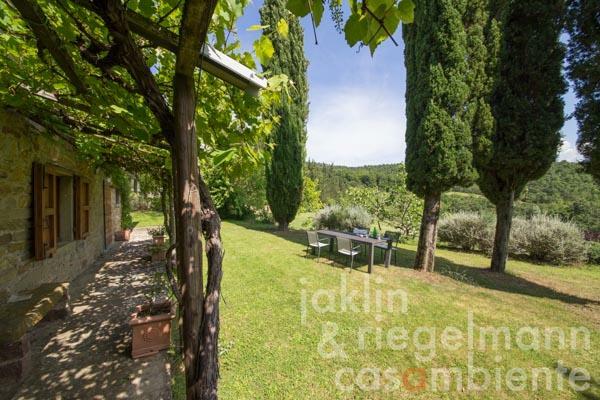 Less than ten minutes away is a truly wonderful fruit and vegetable deli where most Tuscan delicacies and home made pastas can be bought, not to mention a small collection of good wines. A tiny osteria with wonderful home cooked meals is only a few minutes away. 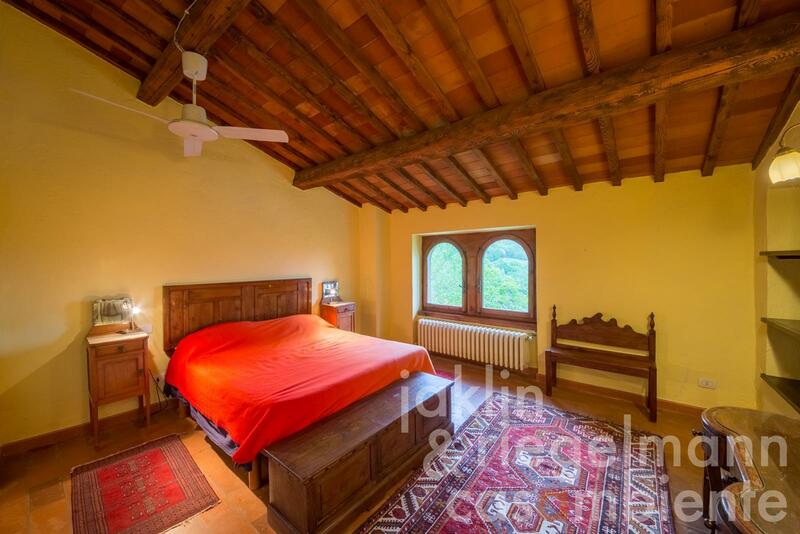 Anghiari with its excellent classical music festival is twenty minutes away. 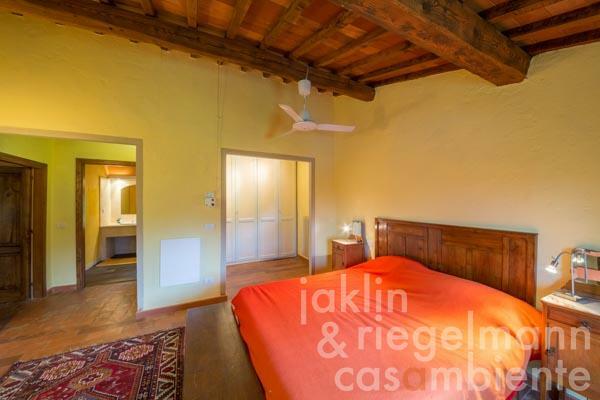 A little further on is the beautiful historic town of Sansepolcro, home of Piero della Francesca. Arezzo is also about twenty minutes away and has a famous monthly antique market, which sprawls through the historic centre. 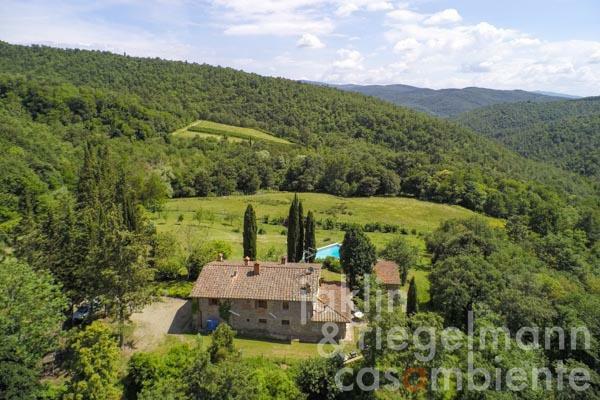 Siena is just over an hour's drive, Perugia is also just over an hour, Cortona about 45 minutes. 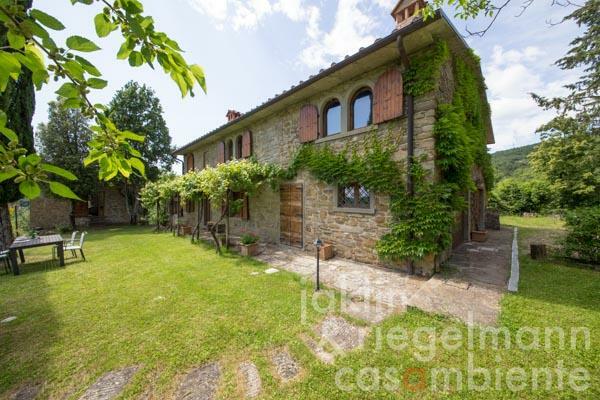 Arezzo railway station is well connected and good for visiting Florence (one hour) without traffic hassles. 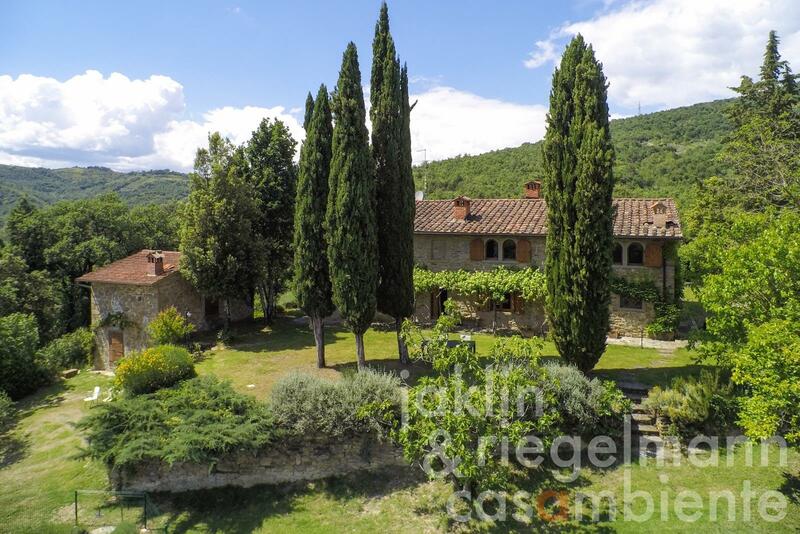 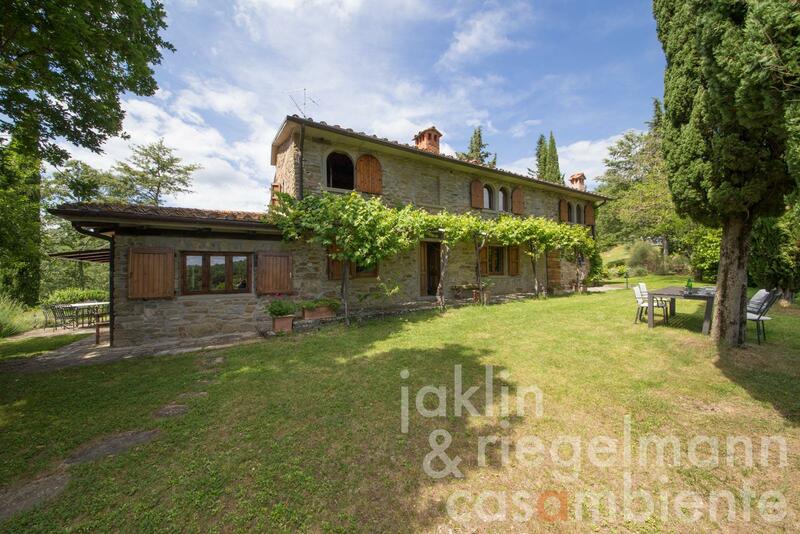 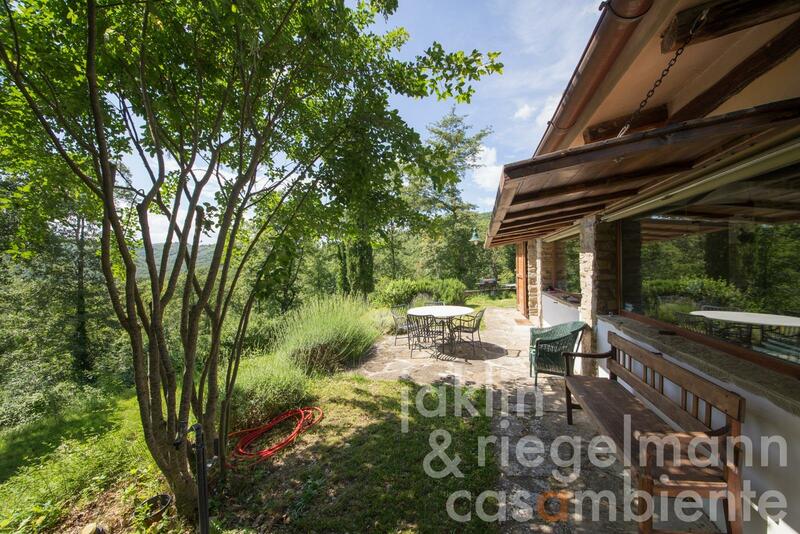 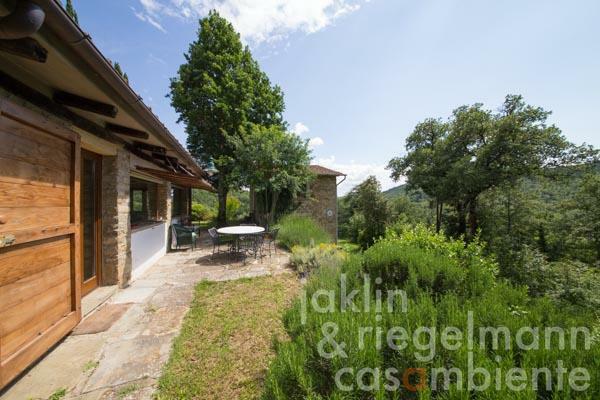 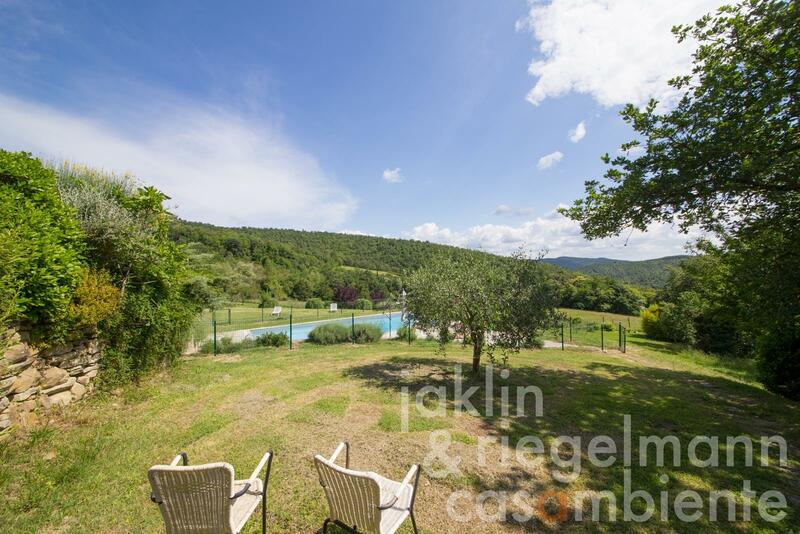 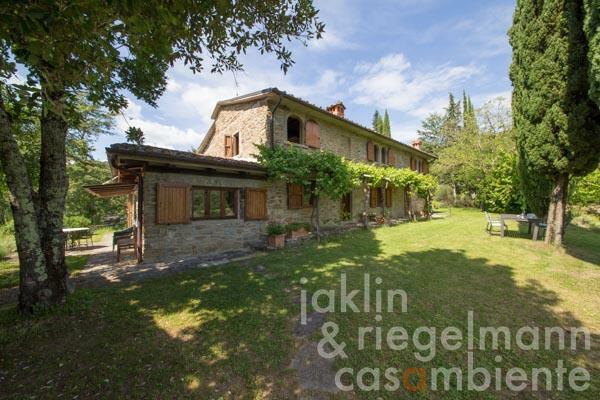 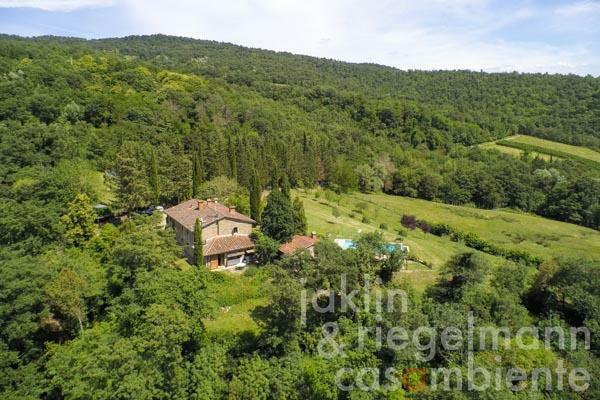 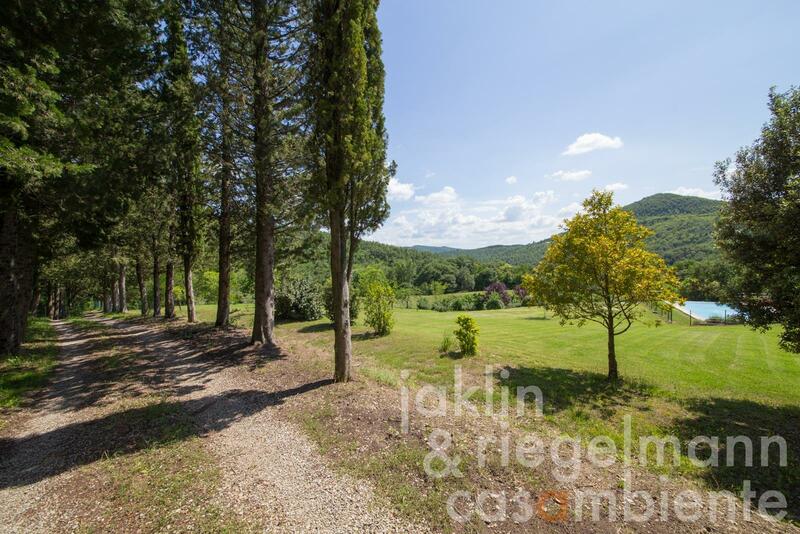 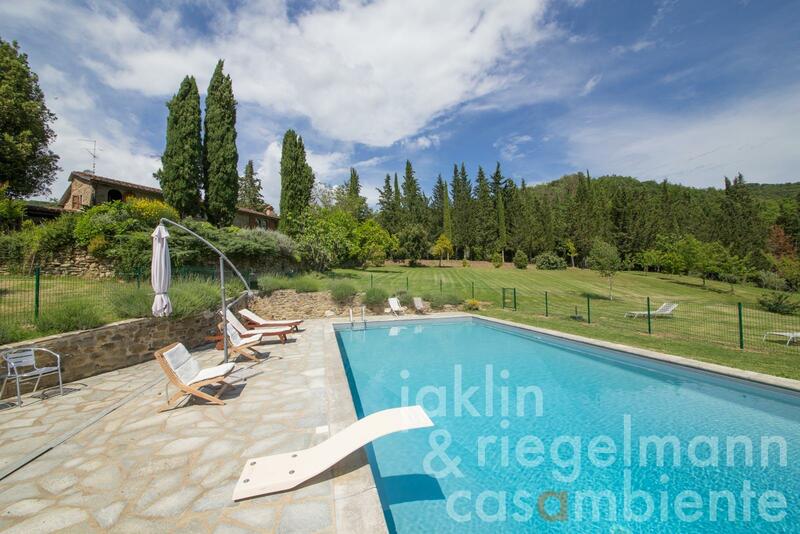 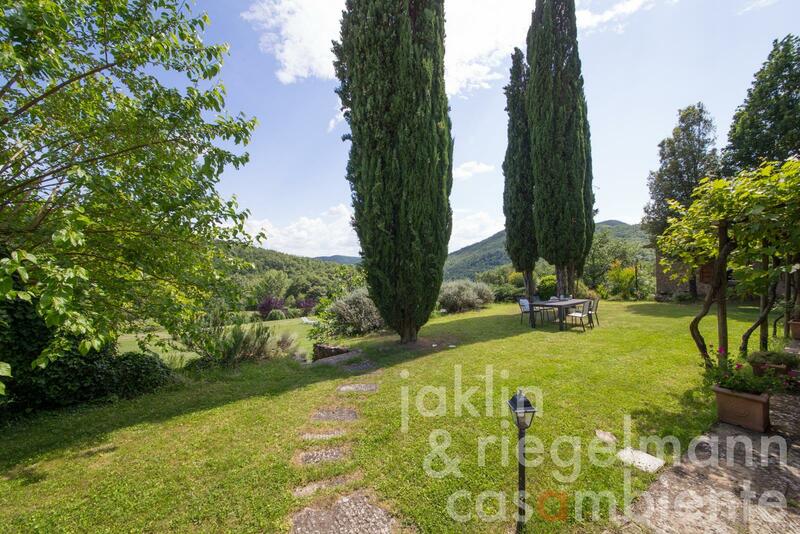 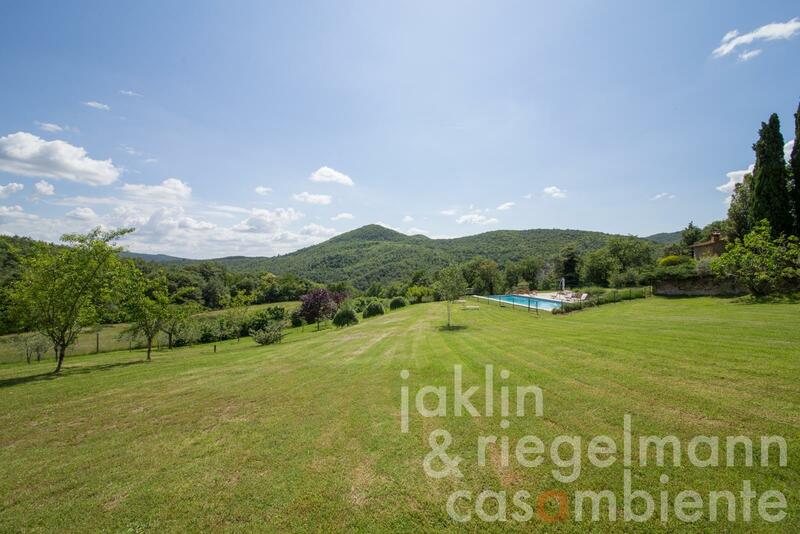 This property is a very fine slice of Tuscany well worth checking out. 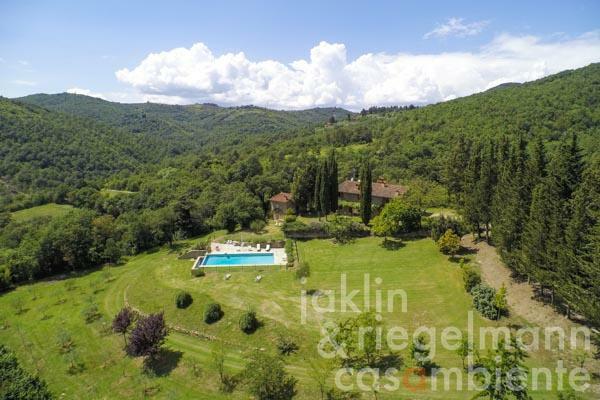 Italy, region Tuscany, province Arezzo. 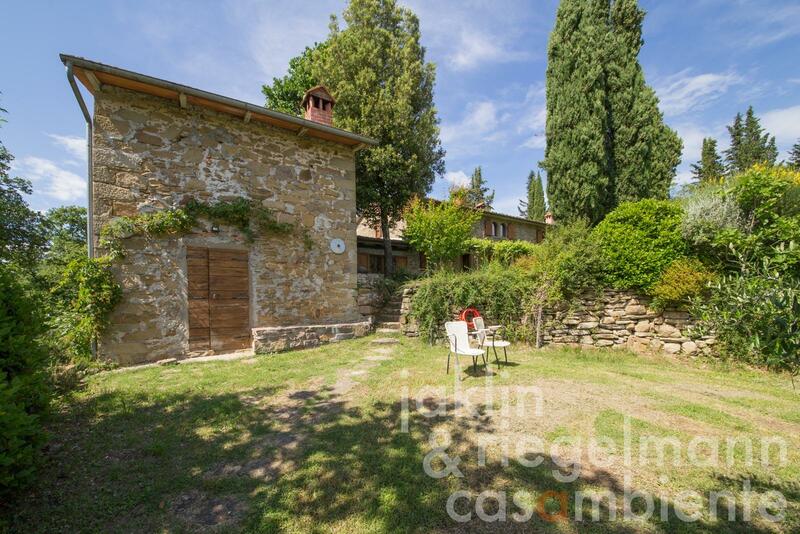 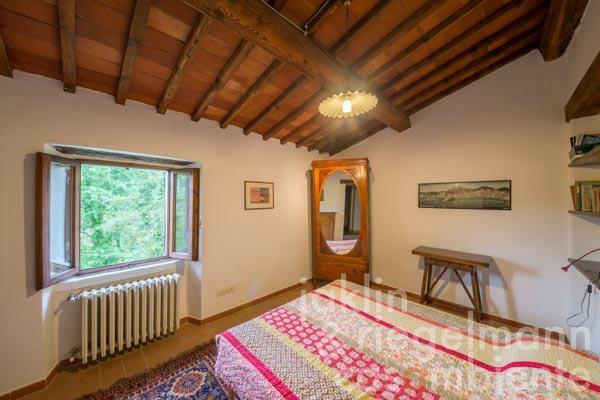 4.02 ha with well-kept Mediterranean garden. Electricity, own spring water, solar thermal system, fireplace, gas tank, telephone, broadband internet access, swimming pool, garage, private parking, terrace, olive grove, garden.